Type and Characteristics: Fore topsail schooner-rigged steam cutter (above), built by John F. Fardy & Brothers, Baltimore, MD at cost of $165,000, construction supervised by Revenue Captain J. White, commissioned 1 September 1865, 550 tons displacement, 165ft long x 26ft beam x 11ft draft, one oscillating cylinder engine, armament and complement not known. Log Period and Areas of Service: 1865-1874, Alaskan waters. 1 September 1865 - Entered service, ordered to Port Angeles, WA, departed Baltimore on 16th, sailed via Cape Horn. 24 February 1866 - Arrival at San Francisco reported. Arrival at Port Angeles reported on 21 May. 29 July 1867 - Arrived at Victoria (south coast of Vancouver Island) on first trip to Alaska. 7 or 20 March 1868 - Exchanged officers and crew with USRC Wayanda. 18 April 1869 - Sailed again for Alaska, arriving at Kodiak on 11 May. 11 June to 2 August 1870 - Voyage to Alaska and return. 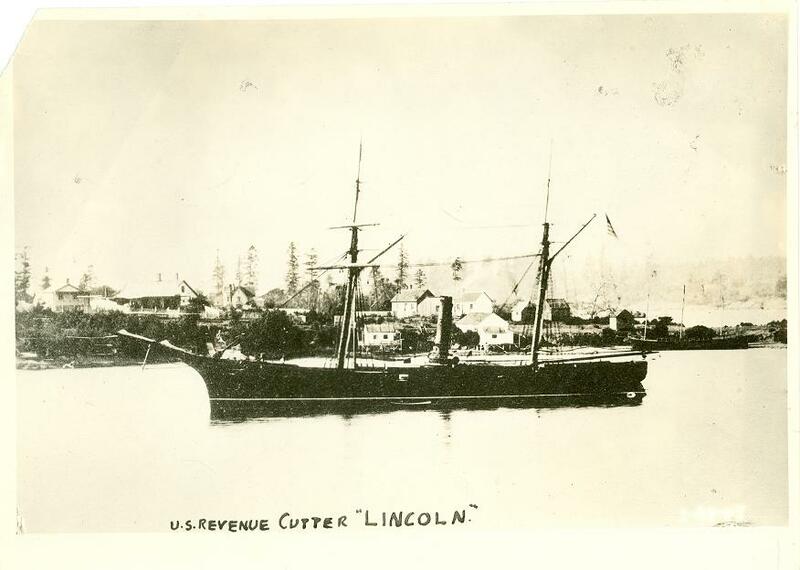 1871-74 - Made three cruises to Alaska, including one carrying the US delegation for the transfer of Alaska from Russia to the US. Later carried a Coast Survey scientific team to the new territory. 14 April 1874 - Decommissioned and sold. Later renamed San Luis. Fate: 15 February 1887 - sank off San Francisco.